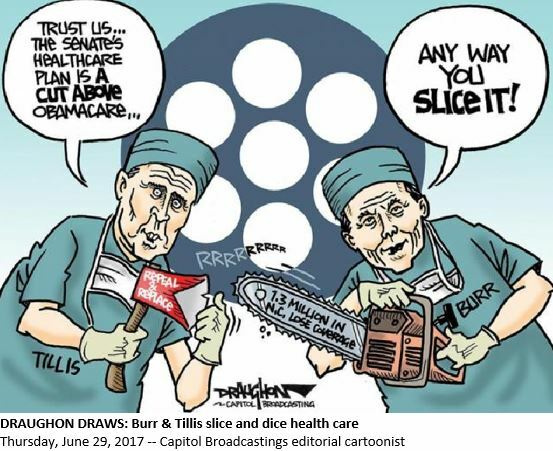 If you were Thom Tillis, but without his paycheck, would you think the Senate Republican health plan is a good idea? Let’s say you were 60 years old, just four years older than Tillis, and from Mecklenburg County, as he is. If you made $40,000 and purchased a Bronze plan on the Affordable Care Act exchange, you’d pay about $1,100 in premiums after tax credits. Under the Republican health plan – the Better Care Reconciliation Act – you would pay $5,420, according to a Kaiser Family Foundation analysis. That’s an increase of 393 percent. Members of the Democratic Women of Moore County are concerned, vocal community members. On June 28, the following letter appeared on the Pilot Newspaper’s Opinion page, authored by Lynn Hancock, currently the Secretary of the DWMC. Fifty percent of all babies born in this country are delivered through Medicaid. About 65 percent of nursing home residents are supported by Medicaid, and over 10 million people qualify for Medicaid based on a disability. About 2.4 million women, men and young people in the United States visit Planned Parenthood health centers in a single year. Approximately one in five women in the U.S. have visited a Planned Parenthood health center. The Senate bill would cut Medicaid by over $800 billion, defund Planned Parenthood, and throw about 23 million Americans off health insurance. At the same time, the Senate bill would repeal taxes on corporations and cut taxes for the wealthy by about $592 billion. So far, the bill is opposed by: AARP, the American Medical Association, American Hospital Association, Federation of American Hospitals, American Association of Pediatrics, American Lung Association, American College of Emergency Physicians, American Congress of Obstetrics & Gynecology, American Psychiatric Association, and Association of American Medical Colleges. Shouldn’t that tell us something? This health care legislation is simply obscene. What sort of people in good conscience could give this bill serious consideration? Currently, all members of Congress are required to participate in the Obamacare exchanges. Many of them will tell you about that, but they neglect to mention that the exchange from which they choose their coverage offers 300 plans, and that the federal government (that would be us!) pays 72 percent of the premium. Perhaps if all Americans had the same access to coverage at the same rates that are available to all members of Congress and their families, affordable health care access would be a reality for each of us. Doesn’t every American deserve to have the same access to affordable health care that our representatives have? Why wouldn’t that be a great idea on which we could all agree?